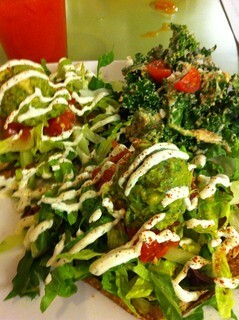 Our next stop on a raw foods tour of Austin took us to Beets, an all raw cafe on West 5th St. It took us a little effort to find the place but once we did it was on! 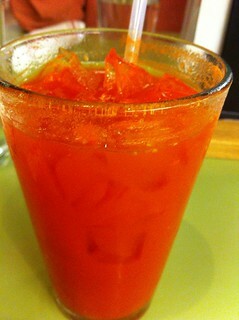 Lemons, gojis and agave. Not too sweet and the gojiness was really intense. And Dan ordered a green juice. I can’t remember what it had in it, but it was green and had lots of ginger. Then we ordered our mains. I had the chalupas- a corn tortilla with sunflower beans, veggies, guac and a sour cream drizzle. Really yummy! I got the kale salad for my side. 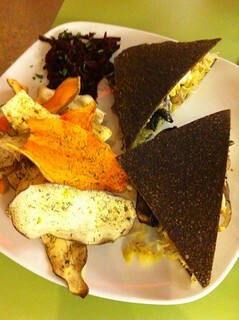 Dan had the raw reuben, it had a mild sauerkraut, homemade raw vegan thousand island dressing, marinate portabello mushrooms, caramelized onions and some kind of cheese on a really nice raw bread. He really liked this dish, and I did too. I would absolutely order this next time. It came with chips and a beet salad. My Dad had the ELT, which was an eggplant bacon, lettuce and tomato sandwich. He *said* he liked it, haha but when I offered to trade him half of his sandwich for one of my chalupas he did not protest (but this is probably a testament to how much the man loves him some Mexican food than anything else!) I liked the sandwich and once again, I was impressed with the bread. The texture was not at all cracker-like, not overwhelmingly flaxy either, soft and yielding to the tooth but not mushy or soggy. And my mother ordered the nori roll appetizer and a side of sprouted lentil salad. 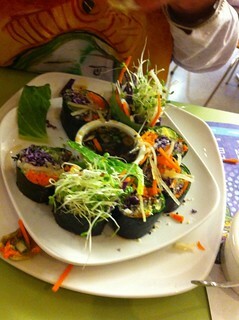 These were fairly basic nori rolls but good for my mother because that is what she wanted- something familiar. 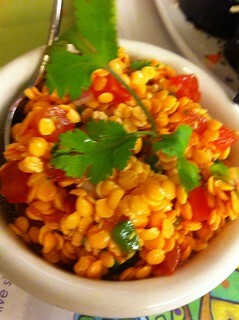 The lentil salad was okay, but I soaked red lentils are just too starchy for my taste. Not a fault of the restaurant, just my personal tastes! The service was great, our waitress was very personable and commented on how well-behaved Amethyst was being (although to me she was fussy!). There is tons of seating and I can’t imagine the place ever being full. The menu had all the classics that you would expect to find- hamburgers, tacos, sandwiches, pizza, nori rolls, juices, smoothies, cheezecakes, etc. 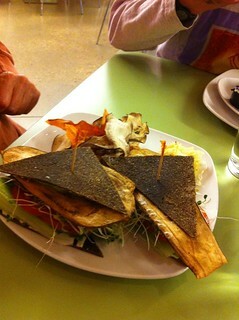 Everything was done well, tasty, reasonably priced and well presented. The only complaint I have is that there wasn’t anything that was really interesting or a new take on the classics.